The first time Carolyn & Steve visited the island, they were “absolutely amazed by the beauty.”As the ferry neared its Nanaimo port, they were amazed to see seaplanes taking off from little coves, snow-covered mountains, evergreens, and water everywhere.“It was breathtaking!”…and still is! Then they met the people, and were equally amazed by the warm, welcoming nature of the locals. To top it all off, they discovered all there is to see and do on this island.With the island being roughly six hours of driving from tip to tip and three hours across, it is easy to do many different activities during a day…or just relax and soak up the salty air, gentle breezes, and enjoy the soft songs of happy birds. 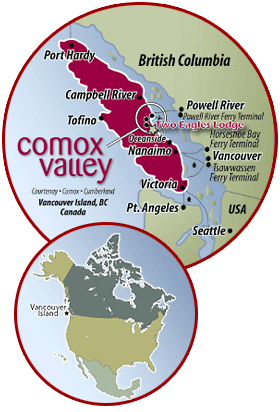 The area in which Carolyn and Steve chose to build Two Eagles Lodge is centrally located on the island’s east coast—approximately two hours to Victoria on the southern tip, Port Hardy on the north end, and 2 ½ hours to the surfing capital of Tofino and its sister town, Ucluelet. Did you know we are further south than London England? Vancouver Island has very temperate weather all year long. We have a Mediterranean climate with dry summers and mild, but wetter winters. For those who do want a winter get-away, world-class skiing with tons of incredible snow is 30 miles away and a pretty drive, at that. Whether you ski downhill or cross-country, snowshoe, or just enjoy a short drive to the mountain, a winter-wonderland is just 30 minutes away from our seaside home. Check out www.MountWashington.ca for more details! There are galleries and many private artisans that invite visitors to their studios. And, the music on the island (and in the Comox Valley, in particular) is incredible. Local pubs and restaurants feature many “music jams” to showcase the talent, so plan to sit a bit, soothe the soul, and soak up some heart-felt lyrics.The annual Vancouver Island Music Festival is an incredible experience each July, with musicians from around the world entertaining 8-10,000 people at an outdoor venue with stages in and around deep woods. And, if that’s not enough, there’s more. A great day of exploring or relaxing would not be complete without enjoying some of the terrific restaurants, many of which offer foods that have been grown locally. Our vineyards offer a great variety of Island wines, and the local breweries give tours.